Providing good grounding — for both AC and DC power as well as for the radio signals — is very important for a trouble-free ham radio shack. Although proper power grounding is fairly straightforward for AC and DC power, grounding for the radio signals in a ham station is a different problem altogether. You have to deal with both situations. Most people hear the word ground and think “connected to the Earth.” What the term really means, though, is the lowest common voltage for all equipment. The Earth is at zero voltage for power systems, for example. Grounding is really the process of making sure that different pieces of equipment have the same voltage reference. 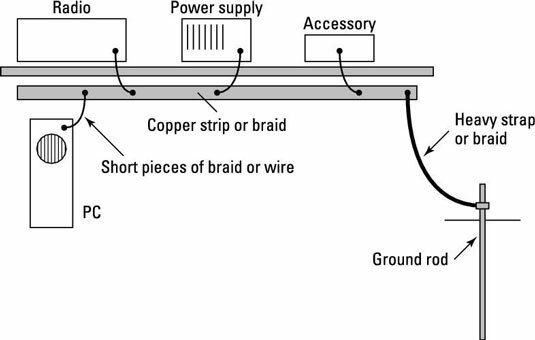 In AC and DC power wiring, grounding provides safety by connecting exposed conductors, such as equipment cases, directly to the Earth or to a zero-voltage point, such as a building’s metal structure. Guiding any current away from you in the event of a short circuit between the power source and the exposed conductors provides safety. When you keep all equipment at the same low voltage, no current flows between pieces of equipment if they touch each other either directly or if you touch both pieces simultaneously. Power safety grounding uses a dedicated conductor — the so-called “third wire.” In the home, three-wire AC outlets connect the ground pin to the home’s ground at the master circuit-breaker box. Because the frequency of AC power is very low, the length of the ground wire doesn’t matter. It must only be heavy enough to handle any possible fault currents. In DC systems, because of the generally low voltages involved (less than 30 volts), power safety is less concerned with preventing shock than with minimizing excessive current and poor connections, which create a lot of heat and are significant fire hazards. You must pay careful attention to conductor size and keep connections tight and clean. As with AC power grounds, the length of the conductor usually isn’t an issue, but its current-carrying capacity is. The techniques that work for AC and DC power safety often don’t work well for the high frequencies that hams use. For RF, a wire doesn’t have to be very long before it starts acting like an antenna or transmission line. At 28 MHz, for example, an 8-foot piece of wire is about ¼ wavelength long. It can have high voltage on one end and very little voltage on the other. 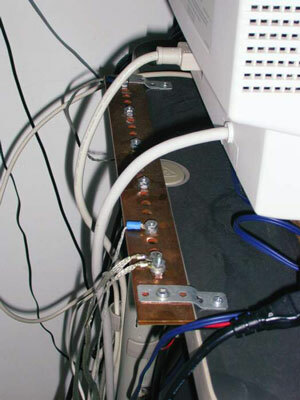 Because constructing a wiring system that has one common low-voltage point at RF for all the equipment usually is impractical, station builders should avoid using the term RF ground in favor of the more general term bonding, which means keeping all equipment at the same RF voltage, not necessarily zero. You can bond equipment together at RF by connecting each piece of gear to a copper strap or pipe with a short piece of strap or wire. Ham gear usually has a ground terminal just for this purpose. Then connect the bonding strap or pipe to your AC safety ground rod with a heavy wire. Copper strap is sold at hardware and roofing stores as flashing. Avoid paying top dollar by finding a surplus-metals dealer and poking around. A heavy bar predrilled with evenly spaced holes can make a dandy bonding strip. Use your imagination; all you need is material that’s wide and easy to make good electrical contacts with.